The Milk Moms who participated in NaBloPoMo got together last night at OurMadillo's for drinks to celebrate the more than halfway point of NaBloPoMo. 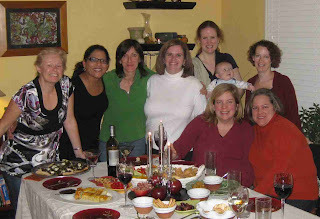 We missed those who weren't with us, whether they were close by (Laurie) or far away (Fiona, Silvia, and La Vida Cochinillo). Pomtinis...yum... Therese had a lovely tablescape (with table decorations of pomegranetes) and delectable (and largely homemade) munchies. A good time was had by all except when I started imposing my own view of marital harmony (and discord) on poor Luchy, then felt embarassed that I overstepped my bounds (shocking, I know). I stopped drinking Pomtinis at that point (I had only had two). Our friend H. had been appointed a few weeks ago to award blog awards, being that she (and her sidekick husband) are regular readers but not bloggers themselves. Hardest Working Gals in Blogging: Mis2pichipurris and La Vida Cochinillo for having newborns and still blogging! It's been quite an adventure and I'm sure glad that Therese issued the challenge. Sure, it's hard sometimes but I love that I'll have a "Month in the Life" preserved for all eternity! Ugh - Esther is climbing all over me and keeps asking when is it her turn. I can't wait until naptime tomorrow when I can call Verizon!!! TWO awards!! I'm so touched. Thanks Helen! And thanks for this recap, Ellen. Really wish I could've been there with you! We really wish you could have been there too Vickie. And thanks for all the kind words here - I LOVED having you guys over. thank you Ellen for posting all that. I am sure Luchy appreciated every piece of advice and does know that we it is our way to show that we do care about her.